The second of seven on campus events sponsored by the Department of Foreign Languages to encourage International Awareness was held Wednesday night with Belmont senior Jackson Wells sharing his experiences over the last three years touring in China, transitioning from student artist to rising star overseas. Long interested in Chinese culture and language, Wells has traveled overseas both to perform in Asia as well as on a study abroad trip with Assistant Professor of Asian Studies and Chinese Language, Dr. Qingjun Li. 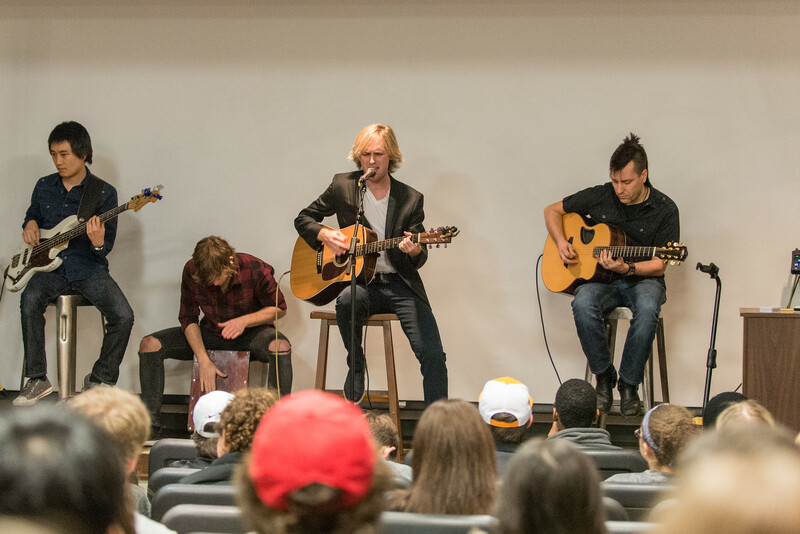 Wells, a songwriting major and Chinese minor, is expecting to graduate in August, and he shared how studying Chinese has impacted his career in unexpected ways. As a musician, his ability to speak Chinese and translate his songs into the language has opened doors to new–and large–audiences. Wells pointed out that artists in Nashville benefit from being around a creative community, and yet, with so much talent locally, it’s often difficult to find well-paying gig opportunities. However, after multiple visits and performances in China over the past four years, Wells has developed an active following and now performs for thousands of fans who know his songs word for word. In fact, he is scheduled to leave in late February to travel to China to begin six months of intensive study at Beijing Language and Culture University. He’ll also be performing at several music festivals and embarking on a tour while overseas. Wells concluded the convo with a mini-concert featuring songs with English and Chinese lyrics. His next album, Souvenirs and Secret Doors, releases later this month in English and will release in Chinese this spring. Other upcoming International Awareness events include a panel discussion on foreign language use in various professions, an exploration of the Camino de Santiago pilgrimage in Spain and an artist’s talk on the influences of Italian culture on her work, and more. Click here for additional details.